Navigo is a private business that exploits two passenger ships on the waters around Amsterdam. The boats are suitable for groups from 20 to 150 people. Business events, family outings, weddings, and all other reasons to meet and celebrate, are welcome on board of our flexible boats. We are known for our personal approach. Every program is tailor-made to meet your needs and wishes. Our friendly staff will see to that. Together with you, we create a day to remember! The Sailboa has been operated by owner Imre Leenhouts since 2009. Next to the private boat tours, a ferry service to fortress Island Pampus and Amsterdam Castle Muiderslot was started in 2011. Navigo was born when the Elvira became part of the fleet in 2016. Next to a group of freelance skippers, sailors, and a few volunteers, Navigo’s backbone consists of three special persons. 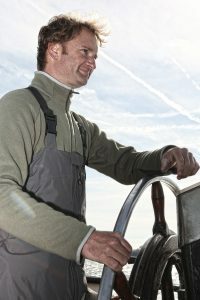 Firstly Jeroen, he is the main sailor, host and handyman. He has a heart of gold, with a twisted sense of humor. Miep and Margreet make the sales team. These warm ladies make sure that your event runs smoothly and becomes a day to remember! Navigo is owned by Imre Leenhouts. As a young boy Imre’s passion for sailing started with windsurfing. He could be found on his board every day of the week. As a teenager he became skipper for a water rescue team. Even though he studied marine engineering, he couldn’t live without his daily dose of sailing. As a skipper he sailed around the world. Upon return to the Netherlands, his dream to combine his passion for hosting events with being a skipper, culminated in buying passengership Sailboa. He is happy to say that his dream to do the work he loves, with nice people, for nice people, has come true! We are proud to say that the people working with us share a spark in their eyes, and a warm character. Would you like to meet us? Give us a call!